Rupert is pleased to invite all to a screening of five films by current and former artists-in-residence and alumni at Rupert. The screenings will start at 5:30 pm on the 17th of April 2019 at the National Gallery of Art, Vilnius, cinema. If you have any access requirements, please email info@rupert.lt. The screening is part of a series of projects and events involving practices and notions of care, interdependence, disability, reflecting in particular on ‘crip theory’ – a term that emerged from disability movements as a reclaiming of the derogatory term ‘cripple’ to critique normative conceptions of health, the body and ways of being. This screening shows films by six artists who reflect on perspectives and positions deemed ‘vulnerable’, ‘sick’, ‘disabled’ and ‘marginal’ and how they can resist and propose alternatives to the assumptions and attitudes about what it means to be a ‘normal’ and ‘functioning’ member of society. The films show the continuing importance of the feminist dictum of the personal being the political and highlight not just how normative ideals and discourses of health and ableism are oppressive, but also how they can be resisted precisely through the very terms and positions that such oppressive attitudes identify as being disabling. *The films will be screened in their original language. Transcriptions and descriptions of the films in English will be available. There will be future special sign interpreted screenings of Avni Dauti and Rebecca Vaughan’s film organised in collaboration with Lithuanian Deaf Society and Kaunas Artists’ House. The film Ô•diz•m narrates a history of ‘audism,’ a term that describes various forms of hearing discrimination against Deaf people, their culture and language, as well as the notion that one is superior based on their ability to both hear and speak. The film imagines a futuristic museum exhibit in which the subject of ‘Deafness’ is on display, and numerous histories of oppression that span time and geographical space are explored. Examples of early medicinal experiments, hearing aid technology and educational practices such as ‘oralism’ are represented through an assemblage of historical objects and biographical details, revealing how Deaf people have been physically and pedagogically coerced into adopting hearing norms at the risk of losing their culture. At the same time, the potential of ‘audism’ emerges as a concept in need of theoretical scrutiny. As an area of study, it can open up many avenues for analysis and can offer a comparative context for thinking about how bodies (especially ‘othered’ bodies) in general are understood in relation to specific historical, political and sociocultural structures, and how most often, this comes from an effort to integrate rather than to include. Avni Dauti and Rebecca Vaughan are artists and researchers from Melbourne, Australia. Their work focuses on Deaf histories and underrepresented historical narratives, encompassing a broad range of collaborative strategies that are critically engaging and encompass film, writing and installation. They are currently working on an interdisciplinary history project with Deaf communities from Russia and Lithuania. 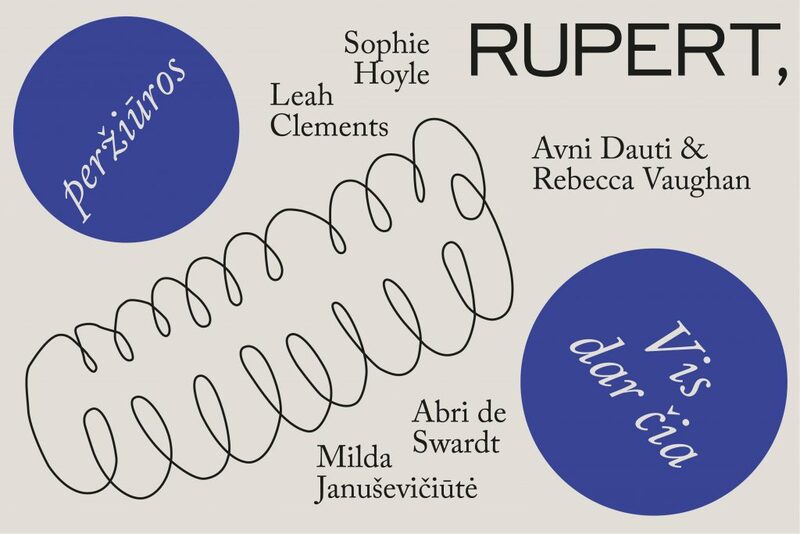 Avni and Rebecca were residents at Rupert, March – April 2019. Single-channel version of a multi-channel installation with video clips, sound and biofeedback equipment (Bitalino Board, Galvanic Skin Response, Electrocardiogram). The order in which the video clips play is controlled by live biofeedback data generated by the artist’s body measuring their heart rate and sweat levels. From lifelong experiences with healthcare infrastructures and having my body measured by biomedical technologies, I became interested in using biohacking as a way of reclaiming autonomy and re-framing the medical gaze. Permastress explores biofeedback as a process that abstracts and reduces lived experience into numerical data, as well as using the symptoms of some of my conditions (Anxiety Disorder, PTSD) to directly generate an element of the work. Audiovisual representations of felt impressions and other physical expressions, such as body language, contrast the data and images of medical apparatus. The work explores some of the experiences of isolation and objectification often felt by people treated within healthcare infrastructures. It is a starting point to reflect on a wider ideology in modern Western medicine that focuses on individualised diagnosis and treatment, and which pathologises the individual’s symptoms rather than addresses their structural causes. Alternative perspectives (including Critical Psychiatry, Anti-psychiatry and Transcultural Psychiatry) look towards wider socio-political contexts of social inequality and marginalisation as a cause of many mental and physical health conditions. Rather than care being solely located in the individual or nuclear family, they suggest looking towards wider, collective networks of support and through shared experiences form a sense of community and political agency. Sophie Hoyle is an artist and writer whose practice explores an intersectional approach to post-colonial, queer, feminist, anti-psychiatry and disability issues. Their work looks at the relation of the personal to (and as) political, individual and collective anxieties, and how alliances can be formed where different kinds of inequality and marginalisation intersect. They relate personal experiences of being queer, non-binary and part of the MENA (Middle East and North Africa) diaspora to wider forms of structural violence. From lived experience of chronic illness, including psychiatric conditions and trauma (PTSD), they began to explore the histories of biomedical infrastructures and technologies rooted in state and military surveillance and control. Sophie Hoyle was selected as a 2019 resident at Rupert. Several researchers and clinical psychologists pointed out the problems associated with ‘false’ hope. Research points to three reasons why false hope is likely to occur: when expectations are based on illusions rather than reality; when inappropriate goals are pursued; and when poor strategies or methods are used to achieve the desired goals. Film hope it finds you well explores cultural and societal differences through the concepts of hope and faith and own personal experience, investigating how they inform philosophies and practices of healing. It is a research-based project, combining fields of sociology, visual anthropology, and auto-ethnographical artistic research. It ties broader sociological research with personal, complex psychological and bodily aspects of human experience. The film intricately couples scientific data with a poetic, intimate three stage narrative which ultimately discusses themes of hope, resilience, faith, the relationship between body and mind, as well as traditions of Western and ayurvedic healthcare. Milda Januševičiūtė is a cultural sociologist and artist based between Vilnius and Rotterdam. She has also worked as a producer, researcher, coordinator, accountant, damage control in various spheres ranging from theatre to music, interdisciplinary and visual arts. These experiences led to filmmaking and currently she is working on an interdisciplinary film project exploring the factors and genesis of particular emotions in the healthcare systems. Milda Januševičiūtė was a participant in the 6th edition of Rupert’s Alternative Education programme. Protection is a portrait of a woman named Elena who falls asleep in stressful situations as a coping mechanism. The audio is a looped clip from a 1993 documentary ‘Multiple Personalities: The Search for Deadly Memories’ where a woman named Gretchen has developed these other personalities to deal with her abuse, which she herself does not remember. When asked by her therapist to confront the trauma, Gretchen disappears and another personality comes forward. To counter this defense, her therapist films one of the other personalities recounting the abuse, then asks Gretchen to watch the footage with him. With her normal coping strategy removed, Gretchen repeatedly loses consciousness, and her therapist tells her to “stay connected here.” The film seeks to ask questions about what forms of coping, self-defense, and self-protection are considered acceptable, by whom, and for whom. Leah Clements’ practice is concerned with the relationship between the psychological, emotional, and physical, often through personal accounts of experiences of unusual, odd, or hard-to-articulate forms of consciousness. Recent work has also focused on sickness/cripness/disability in art, in critical and practical ways. Leah Clements was a resident at Rupert in June 2018. I’ll never wear sunglasses again (2014) hypothesises a fateful meeting between artists Paul Thek (b. 1933, d. 1988), Derek Jarman (b. 1942, d. 1994) and Felix Gonzalez-Torres (b. 1957, d. 1996), through ellipses, cut-ups, cut-outs and torn fragments in scripting, vocalisation, motion-tracking and editing. Questions of interiority, health, the materiality of time, and the hand of the artist are punctuated by a host of fantastical subsidiary characters – Edward Scissorhands, a male ostrich on heat and the Wind Boy. The video considers the ethics of mourning from the vantage point of Elizabeth Freeman’s notion of erotohistoriography, particularly with regards to revisiting and reviving the (chronically sick) AIDS body that defined queer artists of the late 20th century. In asking what art history does to the body of the artist, the work troublingly mirrors the white-washed regimes of health as desirability displayed on digital gay hook-up platforms in the 21st century to work against generational forgetting of a syndrome that persists in the present. Leechcraft and nonhuman animal courtship are invoked to point to wider interspecies relations and interdependencies in holistic acts. I’ll never wear sunglasses again is an archeology of touch both medicalised and intimate. Abri de Swardt (b. 1988) is an artist and writer based in Johannesburg working across video, photography, sound, sculpture, and performance. He holds a MFA in Fine Art with distinction from Goldsmiths, University of London (2014), and was named one of the inaugural Young African Artists by Wanted Magazine. De Swardt is concerned with the difficult visibility and audibility of queer and Southern subjects as proxies of what Michael Taussig calls “effervescent”, “no sooner emerged than” disappearing, the “exact opposite…of monuments”. In his work decolonial, fabulated, and erotohistoriographic approaches are taken to address injustices of recognition and remembrance in relation to data ecologies, ineradicable colonial topologies, and brutalising operations of the lens, by way of a self-termed ‘aesthetics of drowning’ and ‘sunstroke of voice’. Recently his work has been focused on tertiary education and viniculture as persistent markers of colonial annexation of land in Fallist South Africa, a narrative he counters through the personhood of rivers. Abri de Swardt was a resident in May – June 2018. Rupert’s programmes are kindly supported by Lithuanian Culture Council.